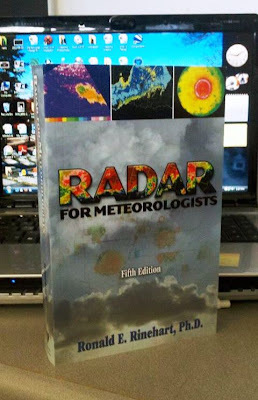 Some people enjoy Harry Potter, some enjoy romance novels...but for us weather geeks, we enjoy reading the advancements in radar technology. 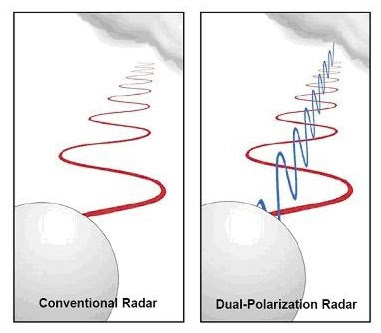 The big change coming to a radar near you is called dual-pole. When radio frequencies were sent out in the past it was only sent out a horizontal radio wave and measure bounce-back radio waves in a horizontal plane. Dual-polarization will now send out the original horizontal radio wave AND a vertical radio wave. This will now be able to determine if we are seeing hail within storms and also pick out errors and get less "ground clutter." We can also start picking up bugs on the radar and other objects like birds, buildings, etc. The good news is that with this new advancement you can now remove data that is incorrect and clean up the radar to only show precipitation. The National Weather Service radar in Wilmington is scheduled to get the upgrade in the fall of 2012. 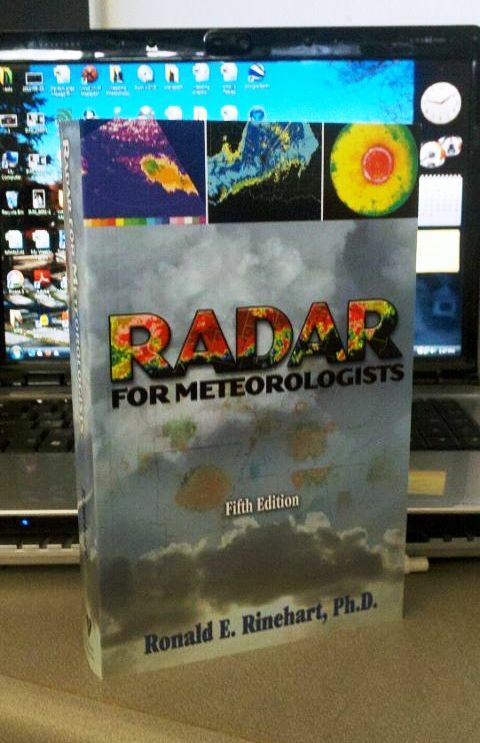 It takes about a week for the upgrade and as a weather geek I am excited for the technology and excited to learn even more about it in my new book, Radar For Meteorologists by Rinehart. Today is still on tap for the warmest day of the month and year. We should get into the upper 50's with rain returning tonight. It should arrive just before midnight and the light rain showers will move out of here pretty quickly. By mid-morning tomorrow most of the rain will be out of here. Temps will top out in the mid 50's tomorrow and then upper 40's for the rest of the week and weekend. With temps in the upper 40's for the weekend it looks like our chance for snow is melting away. The track of the system still is on the move but the last day's worth of models do not show us getting any of the snow, based on its track. We may see a few light rain showers over the weekend, but hey...with temps in the 50's and upper 40's...bring on the light rain showers. I will monitor the system in the coming days because nothing is set in stone yet. Enjoy the warmth and have a good one! This radar image was grabbed at 4:30AM today and you can see that we are dealing with a mixed bag of precip this morning. Temperatures are just below freezing at 31 degrees currently in Dayton. The rain overnight has limited the ice sticking and the rain will help melt any sleet or freezing rain falling. The good news is that temperatures will slowly warm through the morning and we will switch to all rain by late morning. The rain will kick out of here later and we could see a few flurries overnight tonight. Temperatures will be pretty cool heading into the weekend, 39 for the high today, 41 tomorrow, 37 Saturday, and then a cold 30 degrees for the high Sunday. Temperatures will quickly warm into the mid 40's next week. We could see a few flurries tonight & a few flurries over the weekend, but after today not much precip until the middle of next week. Watch out for a few slick spots this morning and then heavy rain later...gotta get back to the news to keep an eye on conditions. Have a good one! I am more tired this morning than any recent morning I can remember. Dawn and I were invited to a Chinese New Year celebration for the year of the dragon. We met up with our group and took a party bus to the restaurant. It was a lot of fun but lasted a few hours longer than what we thought, so I got about ninety minutes of sleep last night. 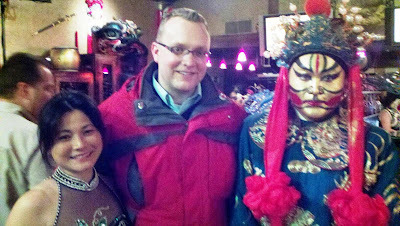 I luckily was able to use "Gong Xi Fa Cai" which is how you say Happy New Year...a co-worker taught me that and figured I better learn how to properly pronounce it. The two people in the photo are friends of our group and family with the head chef at the restaurant. The big accomplishment of the night...I only used chopsticks. Weather looks pretty quiet today. Increasing clouds with a high around 37. Rain showers arrive tonight and will last through the day tomorrow. Tomorrow morning we will drop near freezing so there is a chance for a few icy spurts. Temperatures will warm up through the day tomorrow so if there is any wintry mix it will melt quickly with the falling rain. After tomorrow we look to be pretty dry for the most part. Highs will bounce around in the low 40's and 30's heading through the weekend and next week, but dipping briefly on Sunday as a cold front blasts through with a high of 28. We could see a few flurries Sunday as the cold front swings through, but only a very slight chance. Back to the news...and back to my coffee. Have a good one! The storm came, the storm left. It left us with almost exactly what the forecast was calling for. The one small change was that the leading edge of snow yesterday across the Northern Miami Valley fell as a little sleet and freezing rain as warm afternoon air in the upper atmosphere changed the precip type. The first line of precip was pretty light and then the real moisture kicked up and we had 1-3+" of snow with very light ice north of I-70, and under 1" of snow but 0.25-0.5" of ice to the south. Once again, the I-70 divide holds true...never been quite sure why, but that is time and time again the divide between snow and ice, or ice and rain. I have lived here over a quarter century and it always plays out that way. 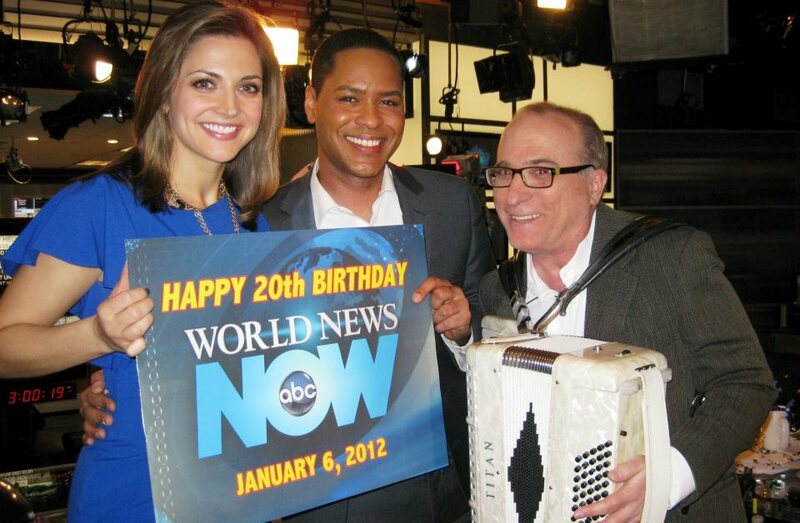 Due to the snow and ice, we did cut-ins for Good Morning America this morning from 7AM-8AM and then from 9AM-11AM. 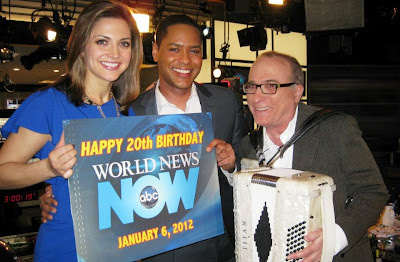 We did a full hour on-air then from 8AM until 9AM. It was a lot of fun, but my voice was starting to go out by the end. Anyway, I am back in here now filling in for Chris Mulcahy to give him a day off since he was working for Jeff Booth, who had the week off for some vacation time. I never realized how quick I am with the graphics and forecast in the morning until I came back to weekends. I had everything done and now have time to write my blog and build a couple new graphics. Well the snow and ice didn't go anywhere today unless you put salt on it...we will be cold again tonight with lows in the low mid teens. Tomorrow temperatures will climb through the day and evening ahead of our next system and by Sunday night into Monday morning our temps will be in the mid 40's so a decent amount of melting will take place. Sunday night strong to severe storms look to roll through the area with a lot of upper level atmospheric support. The timing, as of now, looks to be shortly after midnight Sunday night into Monday morning for the Ohio Valley. The main threat looks to be damaging winds and possible tornadic storms. The one up-side to the system is that it appears to weaken just before arriving to the Ohio Valley and most of the strongest weather will be to our southwest in Western Kentucky and Tennessee. It will need to be monitored very closely and I may have to come in a little earlier than normal Monday morning. Temperatures will fall behind the system and Tuesday we will top out in the mid-upper 30's. The rest of the week we will get back into the 40's, but the chance for rain is a little tricky. Right now there are a couple systems down the pike, but we seem to be sandwiched between them. On Thursday and Saturday we will have a system to our south and another system to our north on both of the days, but we may be dry between the two systems. The models are basically fighting between the polar and tropical jet stream and we are right between the two. I will keep you posted, but please make sure you keep your NOAA weather radio on for Sunday night in the event that severe weather breaks out. Oh, if you live in or near the Mercer County, Ohio area you may be interested in this: The National Weather Service is having a (free) meeting this coming Thursday, January 26, at 6:30PM in Dicke Hall at the Wright State Lake Campus for CoCoRaHS recruitment. That stands for the Community Collaborative Rain, Hail, & Snow Network. The NWS needs ground reports of how much precip falls. The radar can give you an estimate, but the ground reports are what really help establish whether warnings or watches need to be issued based on the amount of precipitation. They will hook you up with a rain gauge and measuring board for snow, but most importantly, teach you how to measure the rain, hail, and snow properly. It would be a GREAT meeting to attend and is free. For more information check out the website they have set up: http://www.erh.noaa.gov/iln/mercer_auglaize_cocorahs.php. Stay safe on the snow & ice and I will see you back here Monday morning. Have a good one! Snow will roll into the area in the late afternoon today and your evening commute could have a light coating of snow already. Snow will continue into the evening hours and warm air will work in from the south. 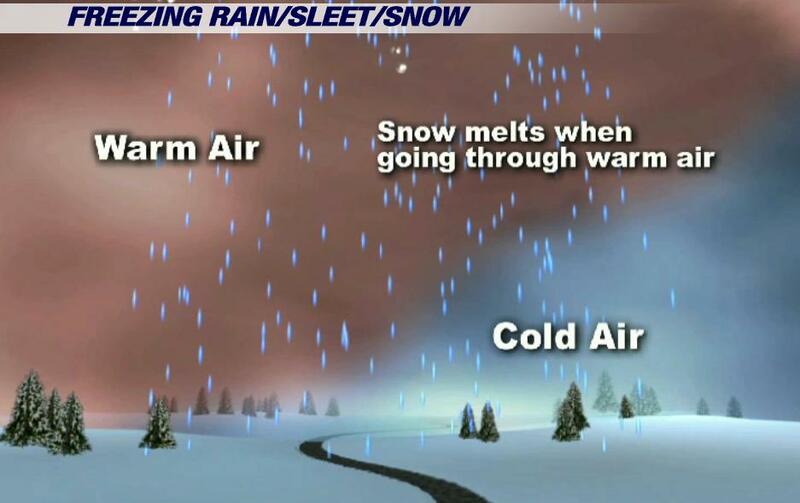 The warm air will be in the upper atmosphere so it will melt the snow as it falls, but then the cold air at the surface will refreeze it into sleet...small ice pellets. This switch will take place just after the evening commute depending on where you live. Warmer air will continue to try to push into the area and that will mean that the rain will not be able to refreeze into sleet and fall as rain, but with temperatures at the surface below freezing we will see it freeze on contact...freezing rain. The warmer air will not affect the north as much as it will affect the south. The south will see the most icing and the least amount of snow...up to 1". The central parts of the Miami Valley will see about 1-2" of snow and a little less icing compared to the south. Then the far north will see the least amount of icing and will be dealing with more snow, 1-3+". It should all wrap up around daybreak tomorrow and then just remaining below freezing all day Saturday. I will say this... this system is the one that you want to WAIT to shovel the driveway or sidewalk until tomorrow. Any snow under the layer of ice you can just break through and then easily remove the ice. If you shovel the snow tonight and then the ice freezes directly on the pavement then you will have a tough time trying to get it off. I dunno about you, but I am waiting to shovel until tomorrow morning when it is all out of here. Saturday will be a mess on the roads because we look to remain below freezing all day long, but Sunday we will get into the mid 40's with rain for Monday and temperatures falling through the 40's through the day and mild temps in the 40's for next week... I am pretty sure a lot of people are looking forward to the 40's with the weather we have been seeing. As if the weather on Tuesday wasn't crazy enough... it appears we will have some even crazier weather over the next 48 hours. Today snow will arrive in the late morning and move out of here by the evening hours. The snow will mainly affect the Northern Miami Valley and the far south may not see much of anything. Right now I am thinking 1-2" to the far north with around 1" still for US36 to I-70. South of I-70 less than an inch and continuing to decrease in depth the farther south you would go. Not terrible, but enough to leave a nice little coating for the north. Tonight we will see the clouds break up a little and temperatures will be in the low teens for Friday morning. Snow will move in briefly Friday night followed by warmer temperatures in the upper atmosphere. This will thaw out the snow as it is falling to the ground and change it to rain but the temperature at the surface will be below freezing so it will freeze on contact with the surface...freezing rain. We could have a light coating of ice by Saturday morning, but temperatures will warm through the day helping to melt the ice. Be careful Saturday morning. We will keep a close eye on this system as it approaches because a degree or two temperature change will really affect what falls from the sky. I hope to break down the forecast for Friday night with more detail tomorrow once we can nail down the temperature changes. Temperatures will warm up a little for the weekend and remain rather mild heading into next week with another system early next week containing a little rain. Stay safe and have a good one! Light snow overnight really left the roads tricky this morning. The rain moved out yesterday and temps just plummeted; cooling it off enough for the snow to stick to the pavement. Temperatures this morning are about twenty-five degrees colder than yesterday. There is not A LOT of snow on the roads, but sometimes that is when it's worse because it's deceiving. So be careful... more snow is on the way. Luckily my commute is primarily back roads so I was able to stop in the middle of the road for this picture...I was NOT driving. Well the light morning show will start to taper off and we will see a little afternoon sunshine, but only a high in the low 30's. Tonight we will see the clouds increase and a chance for snow through the day tomorrow, especially north of I-70. 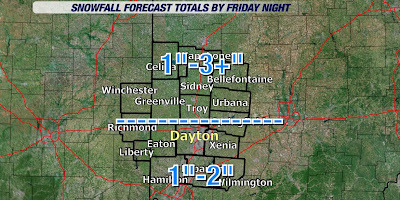 The far Northern parts of the Miami Valley could see a little more than 1" of snow. I think the area between US 36 and I-70 could see up to 1". 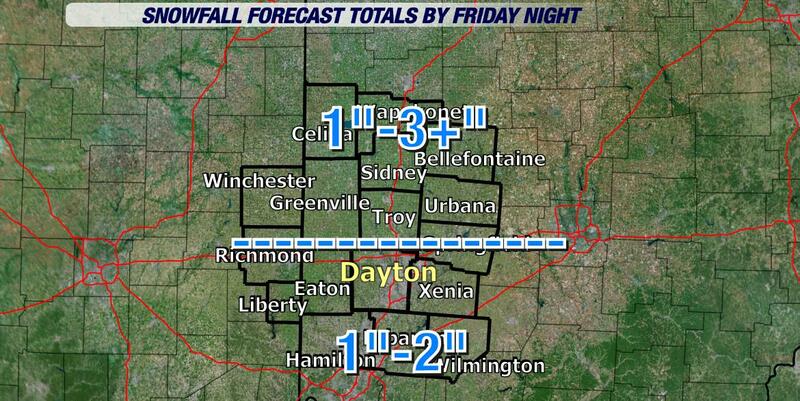 Dayton and south could see maybe a dusting tomorrow, but the majority of the system looks to stay to the north. We will stay in the lower 30's for highs tomorrow and Friday, but Friday night we could be dealing with a little ice. The last couple of model runs appear to be hinting at some freezing rain, but the temperatures will play the main role into what we will exactly see falling from the sky...so we will have to wait until it gets a little closer to pinpoint the type of precip we will see Friday night into Saturday morning. Temps will slowly warm up heading into the weekend and next week. Right now we look to be dry most of the weekend, but rain will return next week. Stay warm, stay safe, and have a good one! Well if you don't like the weather in Ohio......just wait. Today is going to be a crazy day. We are starting off warm with temps in the low 50's and rain showers. By daybreak we will have a line of thunderstorms punch into the Miami Valley and then run off to the east only to leave us with falling temperatures later today and a few light rain showers. By the evening we will be falling into the low 20's and dealing with a few flurries and the wet roads refreezing so watch out for icy spots on untreated roads Wednesday morning. We will remain cold for the rest of the week with a chance for snow Thursday night and Friday Night but then we will warm back into the 40's for the weekend. The models have been trending a little cooler for the weekend so I will keep an eye on what they do over the next day. More rain possible Monday but the weekend looking mild and dry. Still under the weather for the, ehhh, sixth day. Dawn went to Cleveland for the weekend and I did not feel well enough to sit in a car for six hours so I stayed home and rested up. I had a lot of hot tea, rest, and random food. When Dawn is home we plan our meals a week in advance and being there alone allowed me to branch out a little bit. We had strawberries in the fridge and they were about ready to start going downhill so I tried to think of what I could mix up and I had everything for my made-from-scratch pancakes except an egg...so I rolled the dice and made them without the egg. Chopped up the strawberries and added them to the batter... still turned out delicious and filling. They were not quite as "fluffy" though without the egg, but no complaints here. Anyway I spent most of the weekend hanging out with Buckeye, trying to rest, studying, and working a little on my mopeds. The seven-day forecast is quite crazy and has a lot going on. Today we will slowly warm our temps continuously overnight and through tomorrow, so tomorrow we will be in the mid to upper 40's. Rain will arrive later this afternoon and evening and will continue overnight and into early tomorrow. Temperatures will then drop through the day tomorrow and we could see a little snow on the back side of the system tomorrow night as we drop to a low of 19 for Wednesday morning. With the ground being wet, snow will not likely stick because it appears to be pretty light. We could see a few slick spots Wednesday and we will stay below freezing until Friday as we slowly warm up. Right now we look to be in the mid 40's for Saturday and 50's are possible for Sunday. We could see a quick snowy system Thursday, but accumulations look to be pretty light. Rain also possible Saturday, but that, also, is looking light. Quite a roller-coaster of a week ahead as far as the weather goes...I will keep you posted on any possible changes. Enjoy the mild temps later today and tomorrow, just make sure you have the umbrella. Have a good one! I don't have a lot of time this morning for my blog, but I wanted to jump on here and drop a quick line. So far the Southern Miami Valley has seen about an inch of snow and the Northern parts have seen about 1-2" with some places seeing about 3". The real tricky part of this snow is the wind. It will be very difficult to measure accurately because of the blowing snow and you would need to be in a wind-blocked area to measure the snow. We still could see another inch for the Northern Miami Valley this morning and about half an inch south of I-70. The radar image I grabbed is from 5:04AM this morning and we are getting the wrap around snow showers behind the low pressure system. Most of the snow has fallen, but we still could see a little more. There is a weak clipper system Saturday night and Sunday morning and that could bring less than an inch of snow and then we will warm up into the lower 40's for Monday and Tuesday with a little rain and then cold again for the middle of next week. So, watch out for blowing snow this morning and a little drifting snow in the outlying areas. Gotta get back to tracking the snow on-air. Stay warm, safe, and have a good one! I love this blog... you know why I love my blog forecast? I don't have to talk. My voice is really strained this morning and it dropped about three octaves overnight and I would make a GREAT country singer or Ted Williams impersonator. The joke around the studio this morning is that I finally hit puberty overnight. This sickness is really getting to me, but I am throwing everything I can back at it. I am even sleeping with a scarf on to keep my throat warm thanks to some advice from Dawn's grandmother. Surprisingly it works, but is a little weird to go to bed with a scarf on...haha. My throat doesn't hurt too bad since I have been drinking LOTS of hot tea with lemon and just trying to make this a very short-lived illness...even though everyone around me, over 10 people at work, has had it for a couple of weeks. Aight, on to the forecast... which I am sure everyone is waiting on with anxiety. We have light drizzle this morning and patchy fog. The temperatures will begin to drop in the afternoon from the low 40's into the upper 20's by tonight. I expect us to being our switch over to snow between 3PM and 7PM depending on where you live. The snow showers will continue into the overnight hours and through tomorrow. The first half an inch or so of snow will melt on the warm pavement but with the strong winds it will help cool of the roads rather quickly. By the time the snow wraps up tomorrow, here are my thoughts on the snowfall total forecast: 1-2" South of I-70, 1-3+" North of I-70. The far north will be seeing the most and may be tapping into a little lake effect snow as well later Friday. The winds will be VERY strong, between 20-30+ mph, for tonight and Friday meaning that blowing snow and drifting snow will be a problem in the rural areas. The roads for Friday morning will be pretty nasty if left untreated, but with blowing snow even treated roads will be a little nasty. Highs will be in the lower and mid 20's for Friday and the weekend...so much colder as well as snowier. Stay safe out there and try to make the best of the snowy situation. Have a good one! Well I need to make a decision...and pretty quick. 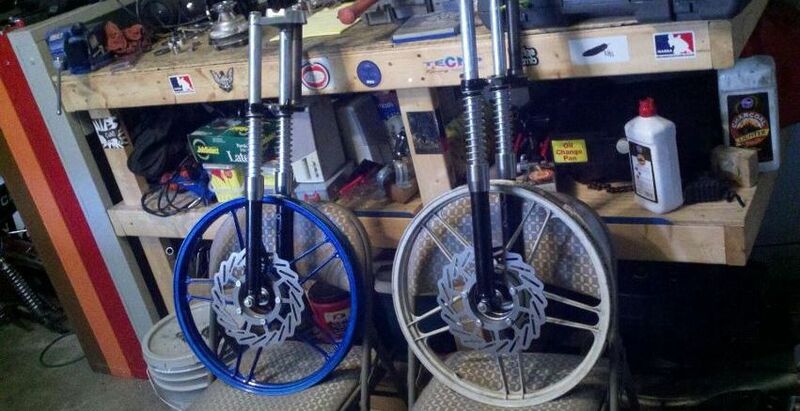 I picked up a blue Puch Maxi and I am debating whether the wheels I rebuilt will match the build I am planning. The blues are not the exact same color and I now am deciding whether to do an all blue build or do a red, chrome, and blue build. Hmmm.... Let me know what your thoughts are... I am starting to lean a little bit more toward the red because it has been my bike for the last couple of years and I have already de-rusted the inside of the gas tank and other cosmetic issues have been fixed. I was excited to see a few more sweater vests had bids this morning... remember, only 6 days left. http://miniurl.org/sweatervests. The weather will be changing back to winter starting now... Cooler today with highs in the mid 40's and then falling temps through the day tomorrow. Light rain on and off for your Wednesday followed by rain changing over to snow tomorrow, on Thursday. The snow will melt at first because the pavement will be so warm, but by Friday morning as light snow continues, the roads will begin to cool enough for the snow to stick. I am still only expecting a light accumulation, but by Friday evening we could have about an inch of snow and in some locations to the north may see closer to 2". The real issue will be when the roads cool off enough for the snow to stick, so be careful Friday. There is another weak system Saturday night that could bring a little more snow and more on Tuesday... so quite an interesting, cold pattern for the days ahead. I will hopefully be able to break down the switch-over time a little better tomorrow as we get closer to the snow and fine-tune the snowfall totals. Stay dry, let me know what you think about the colors, and have a good one! I finally caught what my wife had. She has been sick with a sore throat and coughing the last week and I woke up this morning and I dreaded swallowing each time while trying to get ready for work. I did make sure I took some medicine and made a hot tea for my morning commute. I just hope I can shake it quick because I don't want to have to use my sick days this early in the year. However, considering we do the news for four and half hours, each morning, my voice may be going faster than my wife's. Blaaaaahhhh!!! Well, the big dip is coming. As you can see in the image, the unseasonably warm temperatures are about to turn on us. We hit 46 for the high yesterday and today we should be pushing 50. Rain arrives tomorrow and with that...cooler air followed by a cold blast for the end of the week and the weekend. Thursday we could see the rain transition over to a little snow. We have been so warm the last week that most of it will melt as it hits the pavement so, at best, I think we could only see a dusting. We will begin to dry out with the cold air for Friday and could see another system early next week with a little better chance for sticking snow. The sweater vest auction to raise money for two local charities continues. Don't forget to check out the sweater vests and the details about the charities: http://miniurl.org/sweatervests. Enjoy the last sunny, warm day and have a good one! Wow! What a FANTASTIC weekend! Considering it was the first weekend of January, in Ohio, and we had temps in the upper 40's and 50's...Wow! I took advantage of the great weather as much as possible. We had a couple of impromptu moped rides. First ride was Friday afternoon and we rode about 26 miles. There were five of us riding around West Carrollton, Kettering, Dayton, Moraine, and Miamisburg. We did find another kid riding a moped and caught up with him to tell him about our group, but he just kept riding. Oh well, still had a blast. Dawn and I had guests in town Friday night and Saturday so I spend that time visiting with them and we went to The Greene, warm weather shopping is better than slushy weather shopping. They left early Sunday morning so four of us got together Sunday afternoon for another ride for about 24 miles...so 50 miles total. Couldn't ask for better weather, but the one down side to the weekend was that one of our newer riders, Mike V, got into an accident heading home Sunday night. He broke a few bones, however he is in good spirits. We are not sure what the cause was just yet, but it was a mechanical error of some sort. Luckily there was no other vehicle involved. Well...I come up with some crazy ideas at times. I am moving forward and focusing on the future. With that, I have decided to auction off 16 of my sweater vests on eBay... I know, I know! They have become a staple for my identity on-air doing the forecast, but it is time to focus on the future and I wanted to give them a proper send-off. So I had a poll on my Facebook page and I asked what charities people would donate toward and I got a BIG response. The top two votes were the Hope Foundation of Greater Dayton and Shoes 4 The Shoeless...both local charities. I am splitting the proceeds between the two so check out my auction on eBay: http://miniurl.org/sweatervests. Or you can search my profile on eBay, it is "emrickrd" I encourage you to spread the word and help the auction along and please bid yourself. I even included two of my Christmas sweater vests...GREAT for any of those holiday parties. The auction ends in 8 days so hopefully people will keep an eye on them, but might as well bid now and get your hand in the fun. The beautiful weather will continue for today and tomorrow. We will continue to have highs near 50 with sunshine until the middle of the week when rain returns followed by a little snow on Thursday. Cold air will punch in for the end of the week with highs near freezing and most of the days spent below freezing for next weekend. I will keep you posted on how much snow we are expecting to see as it gets closer, but try to get out there and enjoy as much of the great weather while it lasts. Have a good one! Please click the link to my Facebook poll below. You will understand what I am doing here in a couple days... Having a little auction, but need feedback from YOU first. Thanks! I went to Versailles last week and visited a go cart shop for some "cheap hydros" that they sell. The inexpensive hydraulic forks are all the rage for most people on Moped Army because these k10 Suzuki forks fit many mopeds with minor fabricating involved. Normally hydraulic forks cost about $200, but you can pick these up online or in person at the shop for $39.95. That is a steal in my opinion. I have been working on the forks over the last week to convert them for mopeds and hopefully soon I will have them finished. I still need to weld on a tab to mount the disc brake caliper and refill the hydraulic fluid, but these puppies are about ready to be mounted and complete the frames on both bikes. Now I just need to finish rebuilding the motors and they should be finished... just in time for spring. Speaking of spring, boy it's going to feel like spring this week, despite just starting January. We still have a little snow on the ground, but with the Southerly winds picking up this week we will actually warm up into the upper 40's by Friday. I mentioned yesterday the cold front swinging down over the weekend, but that will only bring "cooler" weather next week with highs near 40. As the front moves through Saturday into Sunday there will be very little moisture to work with and there is only a VERY slight chance for a flurry or sprinkle. I expect nearly all of the area to remain dry the entire time, but will still keep a close eye on it. So dry for the most part and temperatures well above normal for the next week. Enjoy it... I guess Old Man Winter has only visited so far... just hasn't unpacked yet. Have a good one! So far this winter we have had three rounds of snow. One at the end of November, one a the end of December, but yesterday's snow was a first...the first to stick to the pavement. The ground was very warm the last two times and it only stuck to the grass for a couple hours. Yesterday was a headache on the roadways. Since I have been in the news industry it has been VERY clear that the first sticking snow ALWAYS causes the worst problems. We all have driven in the snow and know it's slick, but we easily forget how slick it can be until you slip and slide on the snow covered roads. We really did not see THAT much snow, under an inch for most of the area, but it was enough for us to remember...oh yea, gotta take it easy. Roads will still be slick this morning that were not cleared yesterday and it will not be melting today because we will only get to about 24 for the high. The clouds will start clearing out and tomorrow we will get back into the upper 30's and then 40's heading into the weekend. There is a cold front coming through during the weekend but not expecting any moisture with it. I will keep an eye on it, but looking like a pretty dry change in temperatures. Calling for temperatures in the upper 30's for Sunday and Monday. Once these flurries kick out of here this morning...looking dry for a while...and mild. Stay safe and have a good one!